You’ve decided to take the plunge and work-at-home. You’re probably excited to be your own boss, go to work in your pj’s, and take a commute that only requires a short walk from the bedroom to office. Before you get too carried away about the myriad benefits of working at home, consider the challenges that come with the territory. Anticipating the issues that may arise will help mitigate them if and when they present themselves. Work stuff just has a way of creeping throughout your home. I call it, “the seepage”. It’s not uncommon for me to have work papers in the dining room, bedroom, and scattered across the kitchen table. Ideally, a designated workspace, room, or office will help with the seepage, but some “work contamination” is inevitable. Remember that you are now combining two purposes under one roof: work and home. Be prepared for this co-mingling and prepare your family, as well. Be forewarned if you have curious little ones or even a mischievous pet, an important reference book or presentation document could be marred or dismantled. Kids and work stuff don’t mix well. Keeping the kids away from my office supplies and out of important papers is one of my greatest headaches. Just today, my daughter rescued a correction tape dispenser from the hands of my four-year-old twin boys — but not before they had pulled out at least a foot of tape from the dispenser. You thought that office co-worker who talked about her belly button’s fungal infection impeded your productivity? Office chatter is nothing compared to the distractions you’ll find at home. The laundry, dirty toilets, your best friend’s phone call—all of these activities suddenly seem quite attractive, even somewhat demanding, especially when you’re procrastinating or bored with the job duties ahead. Finding a consistent and predictable work schedule has been and continues to be a great challenge for me. If I want to get real work done, I often have to tell myself … If you were working in an office you wouldn’t be here right now and wouldn’t be cleaning out the fridge or folding towels anyway. Get to work! Set “work hours” and stick to them. Let the phone go to voicemail. Set a timer for those activities you must do then stop when the bell rings (putting away breakfast dishes, for example). Even if you have an office with a door AND a sitter (or spouse or grandparent watching the kids), the family is still going to operate like you are home. Often, I have to lock my door and allow the kids to pound and pound until their father eventually hears them and intercepts (and I’m thinking the whole time, Ummm hello! I’m working down here, remember?) “Ignore me”, I’ll say. “I’m not here.” You should expect a learning curve with your loved ones in this area (I think our family is still learning—and I’ve been doing this for almost six years). And if you think you can be productive AND be a full-time mom — without any intervening help — well, I’ve got news for you. I’m sorry to say that preschoolers and “work-at-home” activities are like oil and water. If you have a newborn who sleeps all the time, you may be able to get a few things done. If you have a preschooler who takes a long afternoon nap, you may find time for some business-related phone calls. I can’t think of any other scenario where a full-time caregiver could also be productive at home for an employer or client. You must have some quiet, uninterrupted time for concentration. This week, especially, work projects have limped along, because I haven’t been at home much to actually work my work-at-home jobs. Although I’ve been a work-at-home mom for almost six years, I still have problems managing my time. I grossly underestimate the time it takes to accomplish things, which is one reason I’m overwhelmed and overcommitted. Another reason is that I’ve been guilty of doing the thing I chastise others for doing: regarding my being at home as “free time”. I’ve found myself thinking, Oh, I’m home. I can volunteer to help with that school fundraiser or that church committee. Before I know it, I’m running errands, setting appointments, volunteering, shopping, lunching with friends—all during my “work hours”. While some aspect of this “schedule flexibility” is exactly why I work at home in the first place, I must be realistic about the fact that if I’m not at home doing my work, I am jeopardizing the growth and performance of my business. Working at an office, you have an arrival and departure time, a boss, meetings, performance reviews — all designed to keep you productive and meeting deadlines. These don’t exist for the work-at-homer. Getting on track, staying on track, satisfying clients, and professional development must all come from you. Want a raise? You’ll need to increase productivity or find more clients. Spent the day at the park with the kids? You may need to put in extra hours over the weekend. You must deliver in order to keep your business going. If you are late, unavailable, or your work is inferior, you’re out of business. Mary Bernard is a wife and full-time mother of three. She has worked for more than fifteen years in various aspects of English, journalism, public relations, and publishing. She’s a freelance writer and editor living in Nashville, Tennessee. And Holly, can’t wait to read your review next week. I hope you’ll accept a comment from a fella! I work at home with my web sites, but I’ve also watched my sister create her own web sites and create a great business at home. She has discipline, let me tell you. All of her work is in one room. She is really good at closing the door and leaving it. And when she’s at work, she is working. I hope to become as disciplined as she is, because I do have trouble sometimes. Some days I just want to play video games instead of working on my business. When I asked her about how to get more disciplined, she said that she has a schedule. And she even schedules in goof-off time. I love comments from men too! I have to make a daily schedule and to do list also, otherwise I can get sucked into tweeting or blog hopping. I just read Nick Cernis’ Todoolist and he has some great ideas for simplifying your life and staying on track. I will be reviewing it next week if you’re interested. Thanks, everyone, for reading and your positive feedback! Great article. While am not a mom (well, at least of a two-legged child), I do relate well to this. Wonderful article. Working from home definately has it’s challenges. 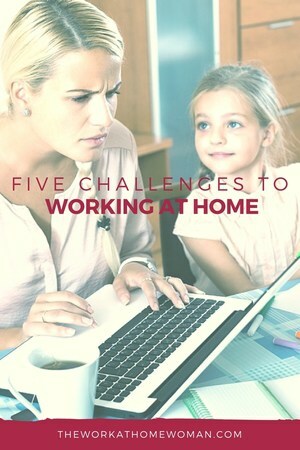 Those who have never tried to be a work at home mom don’t understand how difficult it can be. Sometimes I think they assume we just lounge around all day. In fact I work much harder now than I ever did in a corporate job. With no real boundries between work and home it can become overwhelming. Nevertheless, I will take being a wahm any day, it’s the best job I’ve ever had!! It’s an amazing feeling to be so successful at both mom and entrepreneur! Thanks for giving the tips. I can relate a lot to this list, there are some days when I have over-committed and then end up very overwhelmed by the amount of overload from the different roles. I love the flexibility of being able to work from home, even if I do keep some hours for lecture & appointments, it does have its own unique challenges. Thanks Mary for saying to well just what I tell others when they think working at home is easier than working a job. Take care and God bless.